A few kilometres after the Sälka huts, we found a peaceful spot, close to a stream, and decided to spend the next night there. We did at that point not know that we would not spend only one night here, but two. We had planned food for 9 days and after waking up to another rainy morning, the decision fell easily – no hiking today. Our little world during the two nights. 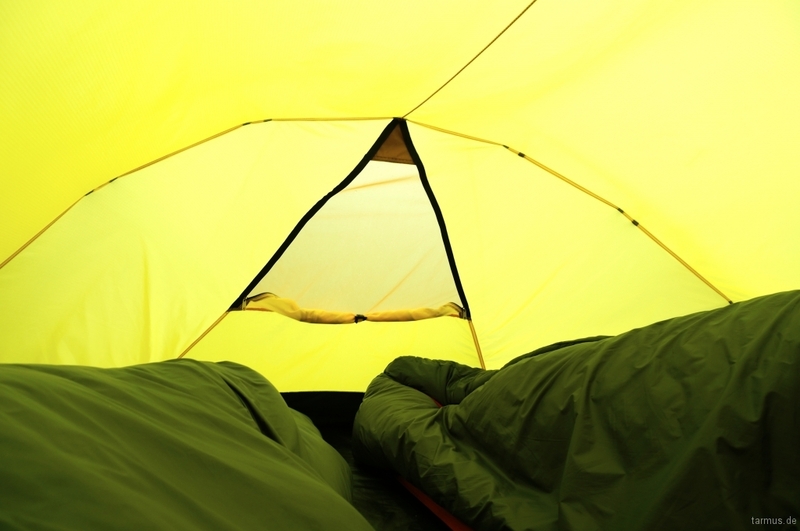 So, what do you do for 2 days “trapped” in your tent? Sleep, eat, read, talk, eat, sleep… something like that :) There were some reindeers visiting us in the early morning hours, probably drinking from the stream, but except form that, only silence. We had chosen a nice spot with a stream nearby. After the second night, we felt restless and just wanted to continue hiking. We missed the changing nature and the fact that you never know what is lurking behind the next hill. Perhaps even sunshine? The clouds were hiding the mountain tops, making the scenery dramatic and mysterious. Just as we had packed up our stuff and started to walk, we met a very nice couple. They own a photography studio and had a lot of photo gear with them so they were dropped off somewhere with a helicopter and could hike and make photos with the comfortability of sleeping in the huts. 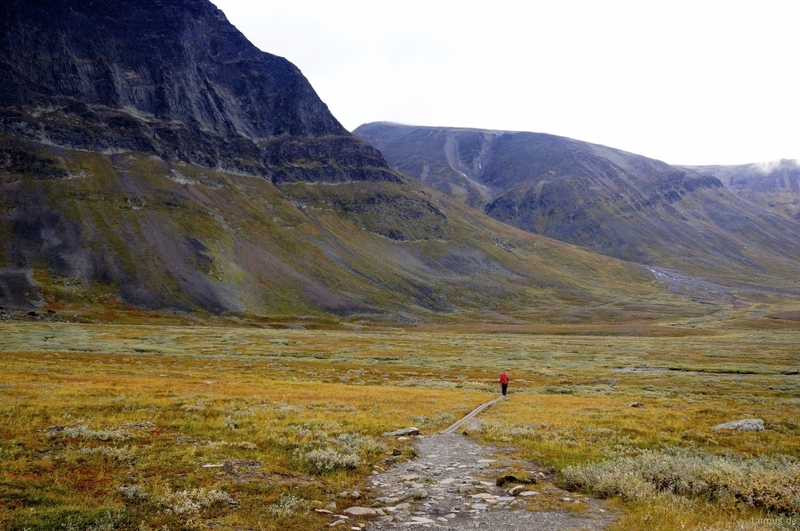 We talked about the route to Kebnekaise and they gave us a tip, not to walk to the Singi huts, but to continue straight ahead over a mountain when arriving to the crossroad leading to Singi. 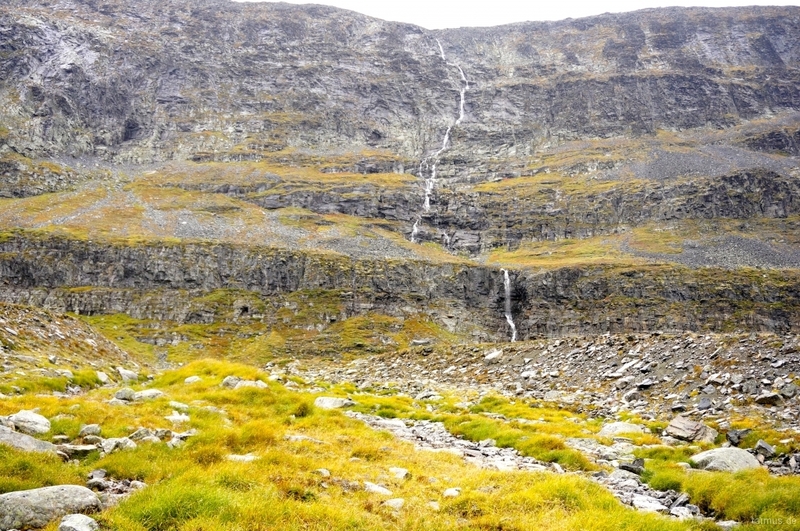 On these altitudes, there were a lot of fresh water and beautiful mountain waterfalls. 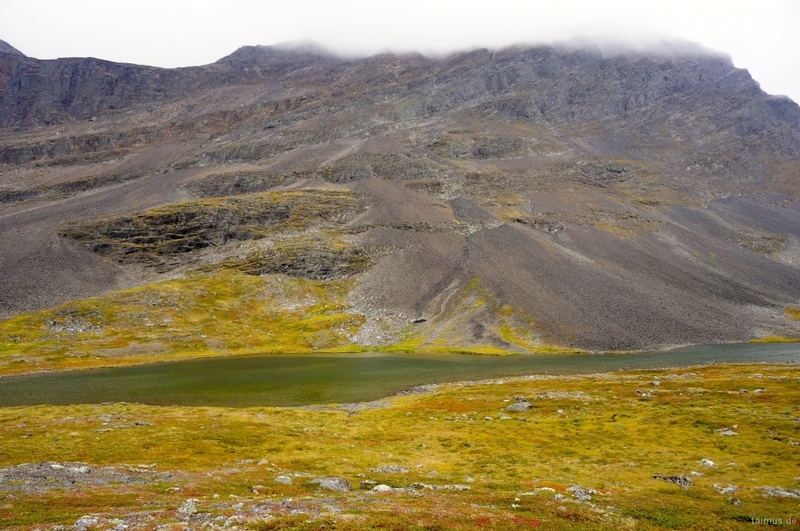 We decided to follow their advice and at the crossroad, a sign saying Kebnekaise 14 km, assured that we were on the right way. After the sign, it is more or less climbing straight up for two kilometres. 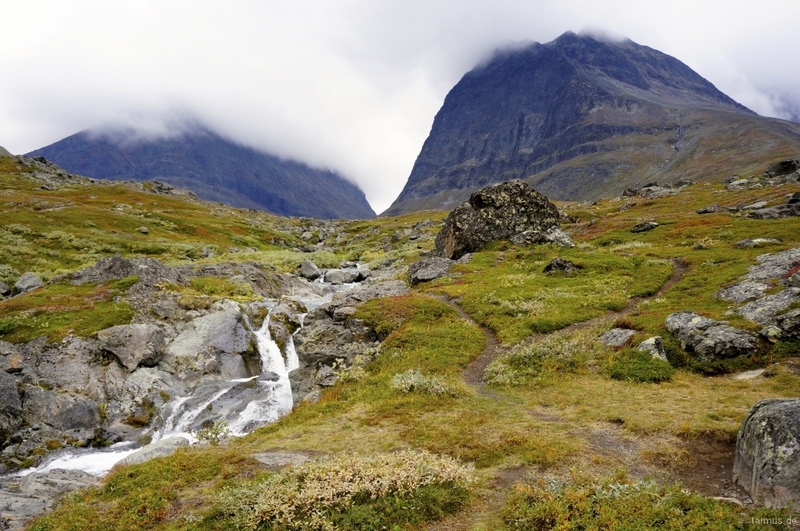 It was not easy and the rain was whipping our faces the whole time, but the views, when looking back on the Tjäktatal towards Sälka, were breathtaking. A hiker is so small in compartment to the mountains. On the mountaintop we filled our water bottles from a mountain lake. The air, as well as the water, was ice-cold. If the weather had been at least a couple of degrees higher, this would be the perfect tenting spot. 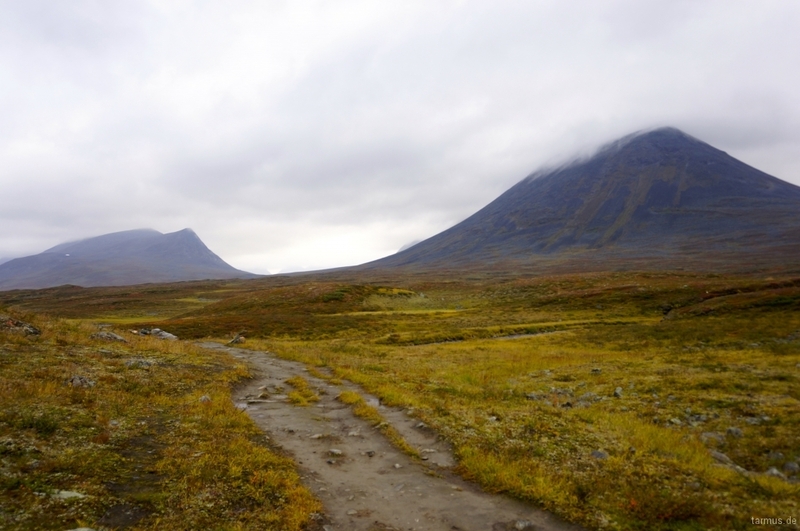 Instead, we had our mind set on continuing to the Kebnekaise huts. So clear and clean water. The way down the mountain was harder than the way up. Very steep, rocky and wet. In the valley below we had to cross several streams that had been filled with so much rain that it was impossible not to get wet. The last kilometres were exhausting but the nature was surely dreamy. Quick water stream and dreamy mountains in the background. 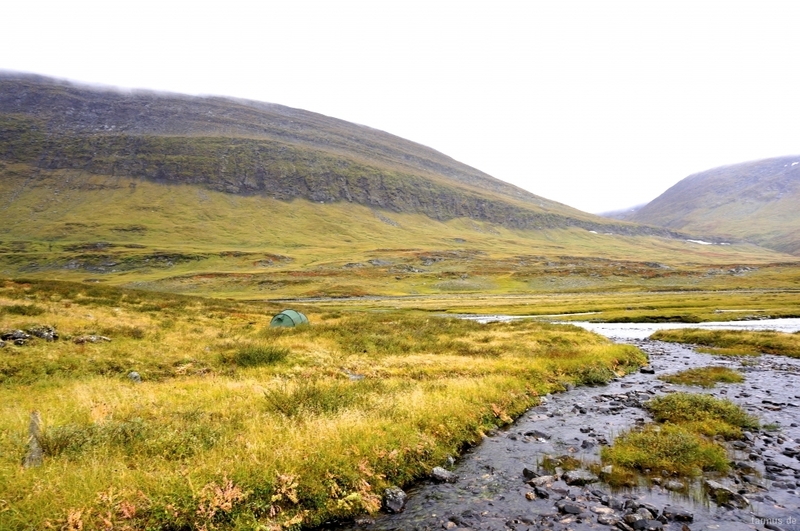 By arriving to the Kebnekaise Fjällstation, after a 24 kilometres long hike, we decided to tent one last night just near the huts. There were many other tents around us, a lot of people, either passing by just as we were, or staying here for more days in order to climb the biggest mountain in Sweden, Kebnekaise. 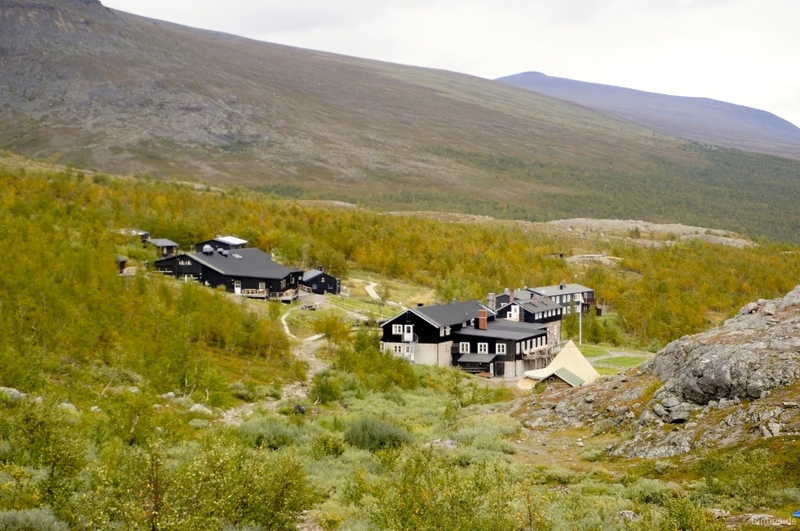 The fjällstation complex host a large restaurant, bunk-bed rooms, cottages, a large service house with kitchen, sauna, showers, drying rooms etc. The usage of the service house is included in the price if you stay in the complex´s facilities, whilst tenters have accessibility when paying a fee. 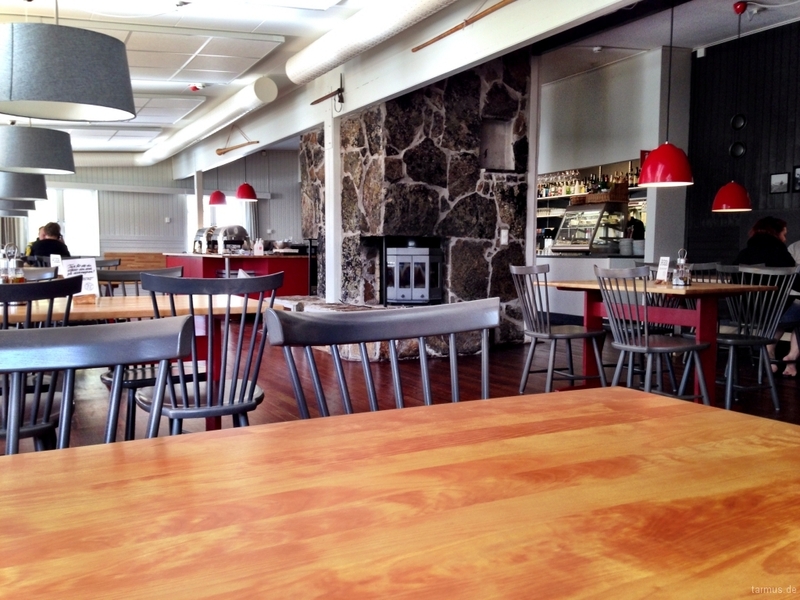 Restaurant in the fjällstation complex. Good place to enjoy a coffee. The next morning the sun was back. 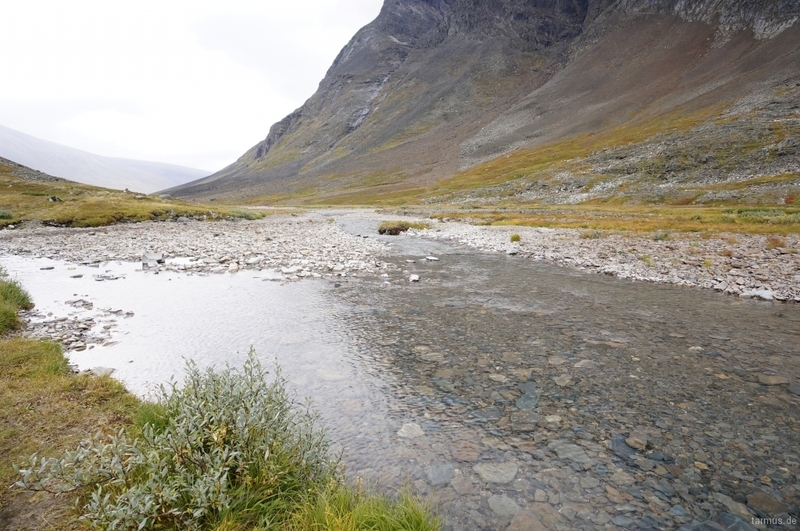 We wanted to rest and explore the nature around the Kebnekaise Fjällstation so we decided to check-in to the hotel and stay for one more day. We used the roomy kitchen in the self service hut for cooking our meals, but we had our dessert and coffee in the cosy restaurant in the main hut. Every 15-30 minutes helicopters were taking off or landing at the airstrip just near the hut complex. 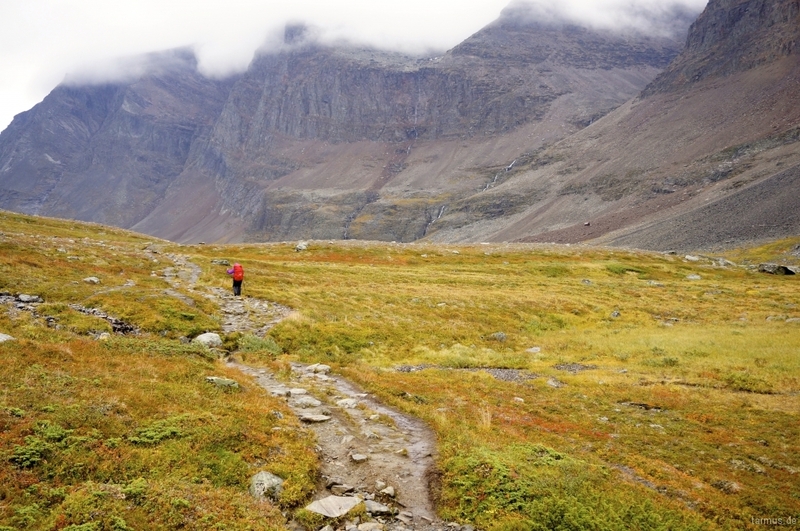 People were leaving for the Kebnekaise top, then they would climb down in guided groups. 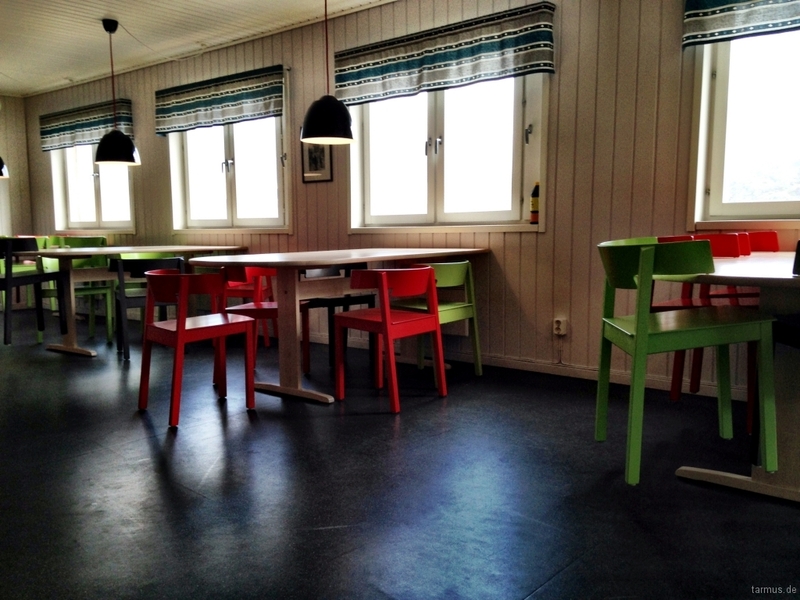 Seating area and kitchen in the self service hut. Before going to bed, we bought snacks in the little shop by the reception, cooked us some tea, and enjoyed the evening by watching the sunset on a bench outside the huts.